A gas stove is something that you would find in almost every household in India. Cooking on a gas stove is the preferred choice because it is compact, easy to use and easy to clean as well. Gas stoves have largely remained unchanged over the years as they have a very simple function to perform. The looks have changed a lot though, plus we have a useful auto-ignition feature where you can start a burner with a switch instead of a lighter or a matchstick. In this article, we take a look at the best gas stoves in India 2019. So what all you would see in this article? First, we have covered the type of gas stoves available in India and the main things you should consider before buying one. Then we would take a look at the best 2, 3 and 4 burner gas stoves with glass top and some with stainless steel top as well. We have covered gas stoves from as affordable as Rs. 1200 to around Rs. 10000. So whether you are looking for a gas stove under Rs. 1000, 2000, 3000, 5000 or 10000, you will find it here. In around Rs. 1000, you can expect a 2 burner stainless steel gas stove, for a glass top you would need to spend around Rs. 2000. After that in around 3000 to 4000 you would see 3 burner gas stoves and above that, we have 4 burner gas stoves. We have made sure all the gas stoves listed here have great build quality so that they work for decades without any issues. All of them are ISI certified so you need to worry about safety. Gas stoves from big brands like Prestige, Glen, Pigeon are listed who provide good after sales service across India. We have arranged them according to price and number of burners. First 3 options have 2 burners, next 2 come with 3 burners and next 3 have 4 burners. The price will go up from around 1000 for the first one to around 10000 for the last one. Now let's take a look at the brief reviews of all these gas stoves. This is the most basic and affordable 2 burner gas stove available. If you have a budget of around Rs. 1000 to 1500, then this is the option for you. It comes from the brand Pigeon which offers 2 years warranty on the gas stove. The gas stove has a stainless steel body with brass burners. It has a manual ignition. The build quality of the gas stove is good. It has anti-skid rubber legs at the bottom which helps to keep the stove stable. There is a good amount of space on top to keep 2 big utensils. This is a 2 burner gas stove from Pigeon with a beautiful black glass top. The body is made of stainless steel. Glass top gas stoves don't only look great but they are much easier to clean as compared to a stainless steel top. Once you are done with cooking, you can clean it in just a couple of minutes with a cloth. The gas stove has good build quality and would last for years without any issues. It is a manual ignition gas stove so you need to use a lighter. The stove has High Powered Brass Burners. The rotatory knobs are made of good quality material and work well. The gas inlet nozzle on this gas stove is of Multi-directional type. On the bottom, we have rubber legs to prevent the stove from skidding. The gas stove is very affordable and is one of the 2 burner glass top gas stove under Rs. 2000 in India. You can get it from Flipkart or Amazon. It is rated 4.1 stars out of 5 by thousands of users. This is a 2 burner glass top gas stove from Prestige. It is covered with a shatter-proof toughened glass top which looks great and can be easily cleaned. The body is painted black and is made of stainless steel. The burner is a good combination of performance, looks, and ease of use. Prestige is a great brand for kitchen appliances and their products have top-notch quality and they offer good after-sales service as well. This gas stove has High-efficiency tri-pin burners which provide a uniform heating to your food. There is plenty of space on top to keep large utensils. The rotatory knobs have to low to high levels to control gas flow and they are easy to use as well. The design of burner and pan supports allow you to cook food faster and more efficiently as well which would mean lower gas bills. The tri-pin burners are made of good grade brass and will last longer and are also corrosion resistant at the same time. The knobs provide precision flame control and safe usage of the gas stove. The pan support on top gives durability and steadiness to pots, pans and other utensils when placed on it. It also enables uniform heating for perfect cooking and helps easy cleaning. For under Rs. 3000, this gas stove provide decent value for money. It comes with a 2-year warranty from Prestige. Get it from Flipkart or Amazon below. This is the same gas stove as we saw above from Pigeon but this one comes with 3 burners. If you are always facing situations where you have to cook something and both burners are occupied then burner gas stove would be a good option for you. Cooking multiple items simultaneously also means saving in time and energy. A gas stove with 3 burners is perfect for a family of 4-6 members. The build quality of the gas stove is good. The body is made of stainless steel and the top is covered with a toughened black glass. The heat-resistant glass top lets you keep hot items right next to the burners without the fear of it cracking or getting damaged. Plus, glass top is always easy to clean. The gas stove has the smallest burner in the middle, medium burner on the right and the largest on the left. The burners are made of brass so you need not worry about corrosion. Anti skid rubber legs are provided at the bottom to provide stability. It is a manual ignition gas stove so lighter or match-stick is the only way to light it up. The pigeon 3 burner glass top gas stove is priced under Rs. 2500 in India. This is excellent pricing from Pigeon and this is our favorite gas stove under 3000. This is a 3 burner gas stove from Glen and it comes with a toughened glass top and auto-ignition feature. There is a battery in the gas stove and you just have to press a button to ignite it. The build of the stove is good. The body is of stainless steel and it is shiny all around. The gas stove will surely add to the look of your kitchen. This LPG stove by Glen is equipped with aluminium alloy burners. The use of aluminium material in the burners ensures that the life of these burners is increased by manifolds. It also provides tremendous heat resistance ensuring a longer life. The burners are also designed so that heat spreads evenly which means faster and more efficient cooking. Plus, these burners are extremely easy to clean and maintain. The knobs are nicely designed and offer a firm grip. They are made of superfine material and ensure friction-less rotation to adjust the degree of the flame. This gas stove is a bit expensive because of the auto-ignition feature and different materials. If you have a budget of around Rs. 5000 then this is a good option in 3 burner category. This is an affordable 4 burner gas stove from Pigeon. The build quality and looks are exactly the same as the Pigeon 2 and 3 burner gas stoves that we saw above. The only difference is that you get 4 burners here which are made of brass. There is plenty of space on the top of the stove. You can cook a lot of things in parallel. It is a great option for large families and would surely help in reducing cooking time. The black glass on the top looks beautiful and can be cleaned easily as well. The knobs are smooth and offer good control over the flame. Anti-skid legs are there as well. Pigeon has very attractively priced this gas stove. There's no other gas stove which offers 4 burners with a glass top at a price of around 3500. It is the best gas stove you can buy under 4000 Rs. 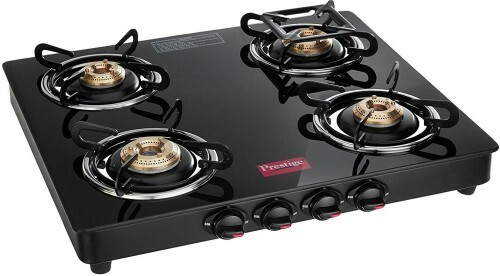 This is 4 burner glass top gas stove from Prestige Marvel series. It is one of the best selling gas stoves in India. The gas stove is all black. The body is stainless steel but Prestige has made it black to match the toughened glass on the top. The gas stove looks very elegant overall. The stove is compact in size and thoughtfully designed to consume less countertop space. The shatter-proof toughened glass top means longer life and convenient cleaning. It has highly efficient tri pin burners, which helps you to cook faster and more efficiently. The ergonomic knob design provides precision control over the flame and is very smooth. The Tri Pin burners on the top are perfect for Indian vessels. They are made of good grade brass so they will last longer and are also corrosion resistant. With tri-pin burners, heat is evenly distributed around the vessel for faster and uniform cooking, irrespective of the size of the vessel. Prestige Marvel comes with individual pan support for tandoor that gives durability and steadiness to pots and pans when placed on it. For ignition, you need to use a lighter as it is a manual ignition gas stove. You can get this beautiful 4 burner glass top gas stove for around Rs. 5000. It is our favorite 4 burner gas stove in India under Rs. 5000. Check the latest price on Flipkart and Amazon via links below. This is a premium looking gas stove and is the best 4 burner gas stove under 10000 in India. It is a bit expensive because of it's design, build and performance. As you can see the design is a bit different here. You have a duplex design where the front burners are placed lower than the back burners. Placing back burners on a height helps to easily access them which is not possible in case of a flat gas stove. The burners are made of brass as it is the case with other gas stoves that we have seen above. The body is made of aluminum so no need to worry about rust. The knobs are of high-quality material and provide good control over the flames. Do note that there is one big burner on the front and one on the back so that you can properly keep large utensils. If you have a budget of around 10000 Rs then this gas stove is a good option. So that's the end of our list of 8 best gas stoves in India 2019. We hope you were able to find a suitable 2, 3 or 4 burner gas stove for your kitchen. Pigeon is making good quality products and their pricing is very affordable. Prestige is the best you can get and Glen is in between those two. If budget is not an issue then go for Prestige products. If you don't want to spend a lot then Pigeon is great.